How do I Subscribe to Your RSS Feed? An RSS feed stands for Really Simple Syndication and let's you easily keep track of your favorite websites and blogs. Millions of sites publish feeds with their latest updates which you can subscribe and stay up to date by using an RSS reader like Google Reader. Once you have a reader you can easily put it on your iGoogle home page and keep updated as sites and blogs publish new information. In this post I'll show you step by step how to sign-up for Google Reader and subscribe to the feed for the blog, Corky on Fashion and Profit. You can then add subscriptions to your Google Reader and all of your favorite sites will be updated in one convenient place like a personalized in-box for the entire web. Whether you're at home, at work or abroad, you can access your Google Reader account from any computer with online access. The first step is to go to Google.com/reader/ to open an account. 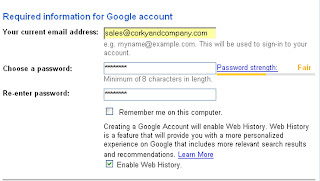 This will bring you to a screen where you will need to create a Google account. Simply click the big blue button and you will see another screen to enter your email address, choose a password and accept the terms & conditions. A message will appear telling you to verify your email. Go to your email in box now. 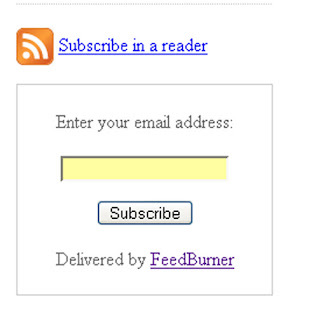 Click the link in the email to verify your email and you will now have a Google Reader account. You'll get this message confirming your account. Then go to Google.com and login with the your email and password. Access your Google Reader by clicking on the my account link at the top right. Under my services you can see the link for your reader. (Just note the iGoogle service because will come back to this later). Click Reader and go there now. On the far right is a screen shot of just the left hand side of your Google Reader. You're now ready to add a subscription to Corky on Fashion & Profit. Open a new browser tab or window and go to CorkyNation.com and look for a subscribe button like the one shown to the here. At the Corky blog right click on the orange subscribe button and select "copy link location." 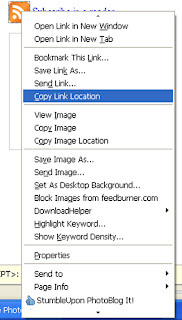 Then go to your Google Reader and left click "add subscription" and then with your cursor inside the subscription block, right click and paste the link location. 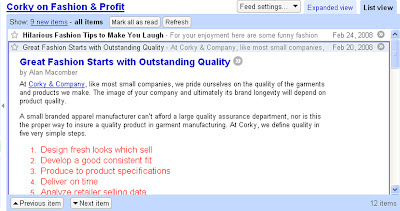 Click add and you now are subscribed to the blog, Corky on Fashion and Profit. After hitting the add button you'll see the screen below which shows the expanded view of your reader. I like the list view, so just click the "list view" tab in the upper right of the reader. This is the list view if the reader. If you select the second headline, that particular headline expands. Now you can read the story, Great Fashion Starts with Outstanding Quality, in your reader. If you want to go to the origin site, just click the headline and you will go to CorkyNation.com. Your Google Reader is working now and your subscribing to feeds of interest to you, but to read the feeds you need to go to your Google Reader. To make your RSS feeds feel like an email in box you need to set up an iGoogle page as your home page. This is simple, when you logged into your reader account you automatically set up an iGoogle service. 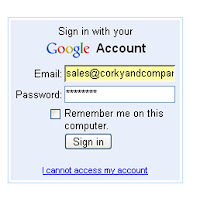 Just log into your Google account and select iGoogle and click on "add stuff" on the right hand side. 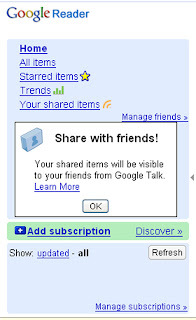 Search for Google Reader and then click add to your iGoogle. Your Google Reader is now in the top left hand column of your iGoogle home page. Now you have an RSS subscription in-box in the left hand corner of your homepage. I hope this tutorial helps at least one person because it took a fair amount of effort. I'm sure I missed a few of the finer points, but as you start the process it becomes very intuitive. Good luck!